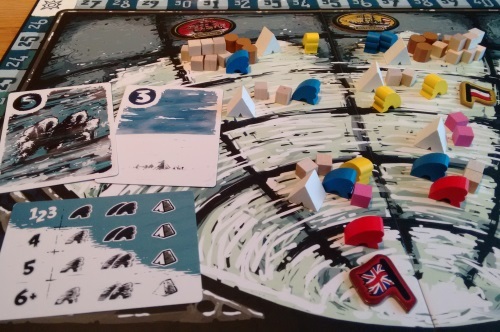 Snowblind* is a push-your-luck dice game with a strong racing element. It will take one to four players less than an hour to play, and does a great job of integrating its rather chilly theme. The box suggests ages 10+ and that’s probably about right, although you could definitely go a little lower with brighter kids. It’s a pretty simple game, although a stupid move can leave you out for good. But as it’s quite a short game, this shouldn’t be too much of an issue (and they’ll soon learn!). As with all of Pleasant Company’s games, Snowblind benefits from the artistic touch of Rob van Zyl. I’m a big fan of his style, although I’m aware it’s not to everyone’s tastes. But it does a great job of conveying the bleak theme, which is further backed by the risk management elements of the game play. The high quality continues with the components. In the medium-sized (about A5) box you’ll find two game boards, about 20 cards, 14 dice, 20 or so cardboard tokens and more than 100 wooden pieces. Everything is high quality, although the dice could’ve done with having a more easily readable font. That said, elsewhere the graphic design is clear. The gameplay in Snowblind is family level fayre: carry out a simple action, then roll a die to see if something unfortunate happens to you: rinse and repeat. But don’t be put off – it’s a lot more fun, and tactical, than this simple mechanism might suggest. The only hidden information is in the weather cards (more on those later), which affect everyone, so teaching/reminding as you go is definitely an option. There are definitely some good and bad decisions to be made depending on your situation, and it may take a few turns to fully grasp them, so a good teacher should flag up any outrageously stupid moves as/before they happen – you don’t want someone dying on turn one (more on this possibility later). Play occurs in rounds (5-7 in all), which are broken down into turns, with the start player moving clockwise each round. At the start of your turn, you choose to either take a dice from those available or pass (if you pass, your rounds is over – you can’t come back in). If you take a dice, you immediately take the appropriate action associated with it. These are simple to explain (with easy to understand icons) and involve a combination of: moving explorers/crates, gaining food/victory points and setting up camps. The aim is to move your captain to the pole, then back to the ship, before the rounds run out – using as little equipment (and losing as few colleagues!) as possible. What messes this up are the dice. Actions will either see you taking a six or eight-sided dice. After your action, you roll – with a 4+ possibly ending in weather damaging you/your equipment. So, taking six-sided dice is best as you have less chance of disaster – but these actions tend to be weaker, and there are less available. Once everyone has had a turn, you get to go again – taking one of the remaining dice, or passing. If you take a dice again, you do the action as normal – but the twist is you now have to roll both your new dice and any you’d already collected, and all failures affect the area you just did your last action in. So the more dice you take in a turn, the riskier it gets. Failures first remove a cube (crates and food); if you have none in the area affected, you must then lay down one of your explorers. If there’s no explorers to lay down, you must remove one from the game (they may be some time…). And if that happens to your captain, your expedition is over. Once everyone has passed, the round is over – but the risk isn’t over yet. You now flip the top weather card – you start with six, which act as the game timer: the ‘pack ice card’ is shuffled into the bottom two cards and if drawn signals there’s just one round to go. But the weather cards also have a number on them – which acts the same way as a die roll, but affects all players. It is applied to the area nearest the poll you have an explorer – so ending your round with your captain in a risky spot can really be deadly. When the game ends, you’ll get points for all the crates you have on the board, your explorers in the ship, plus a variety of possible bonuses – or you score nothing if your captain perishes out on the ice. Most victory points wins. The writer: I can’t decide whether Snowblind could win over push-your-luck detractors, but those who love this mechanic should definitely try it. But this really is a push-your-luck game – all but one action will give, at best, a 50/50 chance of taking some kind of damage. 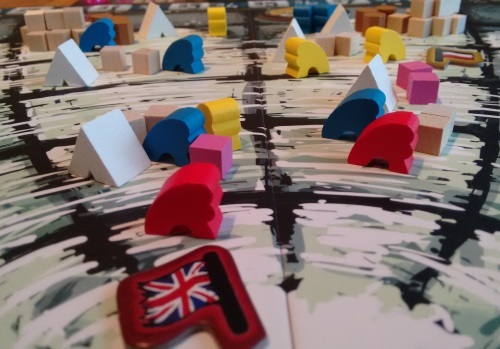 If you don’t like luck, you’re not going to be won over – but if you like theme, and can manage short games that may screw you, it’s well worth a look. The thinker: While I wouldn’t say there is zero strategy here, there certainly isn’t much – and as with all good push-your-luck games, you’ll need to change your thinking both on your own rolls of the dice and how your opponents are doing. But for the game length, it makes for a fun opener or closer – especially as set up time is also relatively short. The trasher: It may look as if Snowblind has nothing to offer the more aggressive player, but there’s certainly fun to be had with it – largely in the meta game. More cautious players can soon get behind the curve in terms of progress, which is where you can start to ramp up the table talk. And pushing it with extra dice can be a real laugh: I’d rather crash and burn than be boring – especially in a 30-minute game! If it all goes wrong, I can chat until the next game; no biggy. The dabbler: I really like the art style and while its largely just wooden bits, I really find it evokes the theme well. 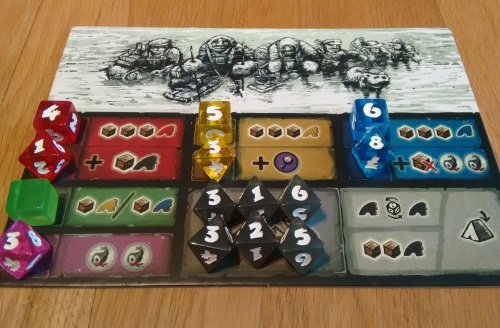 It’s a shame the equipment you can collect (taking the eight-sided yellow scientist dice) has different little pics in it, but they don’t actually do anything. I guess this is put in to give scope for an expansion, but I wish they had done more with it. That said it’s nice that the ships have real names and each player has a national flag for their crew, as this can encourage a bit of fun role-play from the dafter members of the group! The key point of contention for me is that, like it or not, Snowblind can be a little fragile. If you get easy weather cards and the pack ice comes out as the last weather card, it’s likely you’ll all be home and hosed without too much stress. Oddly there is no reward for reaching the pole first, and only a two-point bonus for getting home first. This means a slowly-slowly approach can win you the game; odd in a race game. One mitigation against this is that if someone gets completely home early each other player has to roll an additional dice from then on: but that seems scant reward for essentially having nothing to do while you wait for others to complete the game. 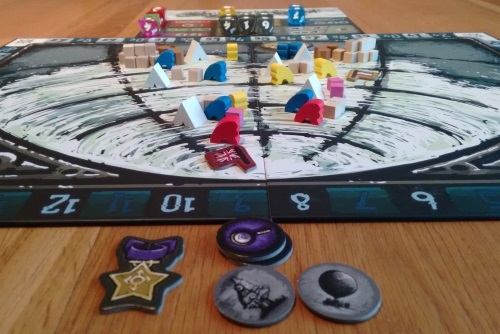 On the flip of this, the game has no player interaction – but possibly player elimination: not exactly what you expect to hear in modern board games. In fairness, player elimination is very rare (I’ve seen it once in five games, across all player counts) and while there is no interaction it does feel like a multiplayer game due to the banter on the dice rolls and the short, snappy turns. I wouldn’t recommend the game for solo play: the randomness falls a bit flat if you have a lack of competition with friends. That said, it was nice to be able to learn the game fully by using this mode – and it plays well with two, three or four. And finally, why isn’t designer Simon McGregor’s name printed on the front of the box? It’s very rare not to see this nowadays, and it must feel like a bit of a slap in the face. I like Snowblind a lot. Despite clearly being a very abstracted game it really does tell a story and build tension, beautifully tying in the thematic element – but like all good games with theme, this can lead to occasionally disappointing games. However, I’m much more willing to accept the occasional slightly ‘meh’ game when the whole thing plays out in 20-30 minutes, unlike some of the tedious Ameritrash games (I’m looking at you, Dead of Winter) that take that long to setup and can give a dreadful play experience over an extra couple of hours. A definite keeper for me. * I’d like to thank Pleasant Company Games for providing a copy of the game for review.